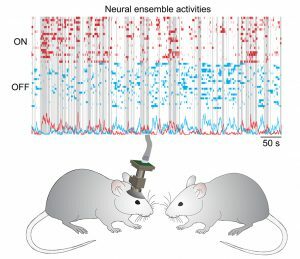 Distinct and Dynamic ON and OFF Neural Ensembles in the Prefrontal Cortex Code Social Exploration. Hot Off the Press – October 10, 2018. Using miniature fluorescence microscopes (miniScope) via an implanted optical microprobe, Liang and Zhang et. al. 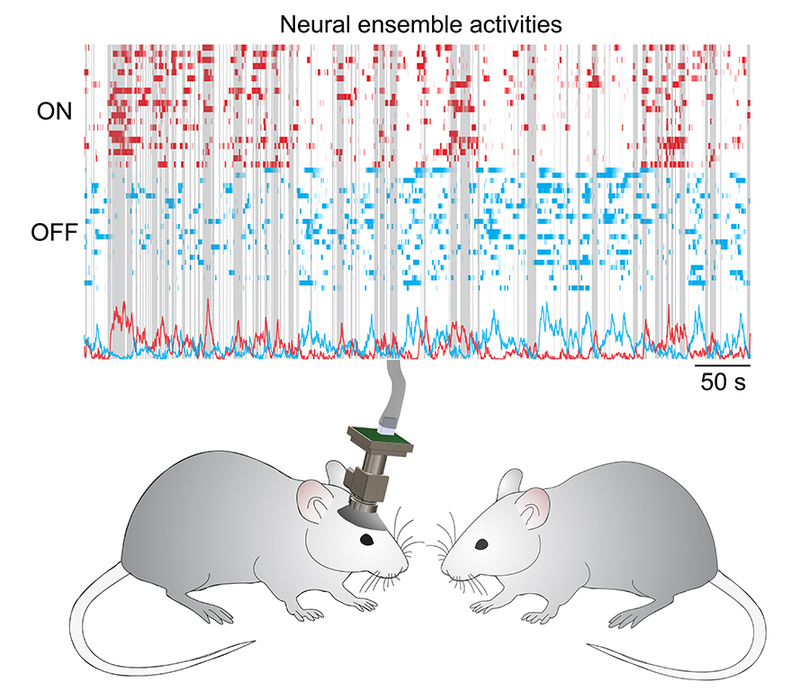 were able to record the calcium activity from hundreds of nerve cells in medial prefrontal cortex (mPFC) when the mice freely engaged in social exploration. They track the activity of the same nerve cells for days to weeks and found that “Yin and Yang” nerve cells in the brain dynamically code social exploration. They further showed that systemic administration of the psychedelic drug phencyclidine (PCP, street name Angel Dust) elicited deficits in social exploration, which was associated with reorganized and dysfunctional “Yin and Yang” nerve cells coding social exploration. Their approach could be applied to other mouse models of schizophrenia and autism spectrum disorders, paving the way for future studies of elucidating pathogenic mechanisms for social behavior deficits in these psychiatric disorders. Neuron, 2018, ISSN: 1097-4199 (Electronic); 0896-6273 (Linking). The medial prefrontal cortex (mPFC) is important for social behavior, but the mechanisms by which mPFC neurons code real-time social exploration remain largely unknown. Here we utilized miniScopes to record calcium activities from hundreds of excitatory neurons in the mPFC while mice freely explored restrained social targets in the absence or presence of the psychedelic drug phencyclidine (PCP). We identified distinct and dynamic ON and OFF neural ensembles that displayed opposing activities to code real-time behavioral information. We further illustrated that ON and OFF ensembles tuned to social exploration carried information of salience and novelty for social targets. Finally, we showed that dysfunctions in these ensembles were associated with abnormal social exploration elicited by PCP. Our findings underscore the importance of mPFC ON and OFF neural ensembles for proper exploratory behavior, including social exploration, and pave the way for future studies elucidating neural circuit dysfunctions in psychiatric disorders. Home / News Main / Hot off the Press / Distinct and Dynamic ON and OFF Neural Ensembles in the Prefrontal Cortex Code Social Exploration.